Managing a small hotel, guesthouse or bed and breakfast can be a very rewarding experience, especially when guests leave happy, promising to visit again soon. Most managers strive to provide the best experience possible and work hard to make sure their business runs efficiently, so that guests can relax and enjoy their stay. Investing in new technology is one way to improve the guest experience. In recent years technology has had a positive influence on many areas of hospitality management, including applications for access control. Electronic digital door locks are now commonly used in place of locks and keys because they offer so much more in terms of convenience. Rather than using a key, fob or card, access is gained by punching in a four-digit code on the keypad. Room key management is a concern for many managers because keys have a habit of going missing, and simply replacing the key does not necessarily regain ‘control’ of the lock. To do this properly, a new key cylinder should be fitted – which, as well as being costly and time-consuming, is inconvenient for the guest. By comparison, if the code on an electronic keyless lock is compromised, it can be changed on the door in seconds. 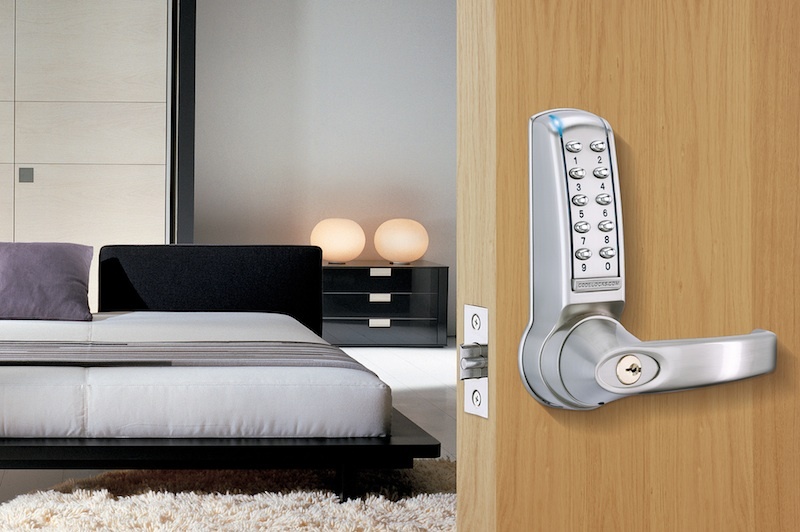 We are the first digital lock manufacturer to design locks specifically for securing guest room doors. We have two electronic keypad locks in the GuestLock range, available with either a knob or lever handle. Just as a guest would select his/her own code for the room safe, guests select their own personal four-digit access code on arrival. They do this by first entering a unique lock identification number for their room, followed by their code. Each lock has a Master Code and can store up to 20 Sub-Master Codes, allowing house keeping and maintenance staff to be given their own codes. When a guest leaves, the manager or house keeping staff can access the room using their code, and delete the guest code at the same time. The door is now locked until activated by the next guest. Each GuestLock comes with its own step-by-step installation and programming manual, and using a local locksmith, the locks can be fitted, and up and running very quickly. Depending on the model, once in place a GuestLock will provide 80,000 openings from two AA batteries or 200,000 openings from four AA batteries. GuestLock is a stylish and simple access control solution, designed to help hotels, guesthouses and bed and breakfasts provide a professional and efficient service. Keyless locks are much easier and more convenient for everyone to use; guests don’t have to worry about carrying room keys around and managers save money on replacement locks and keys. For more information on products in the GuestLock range visit our website or click here to see a product review video.